When I tried to connect a 12.1 database from an Oracle client 9.2, it failed with ORA-28040: No matching authentication protocol. 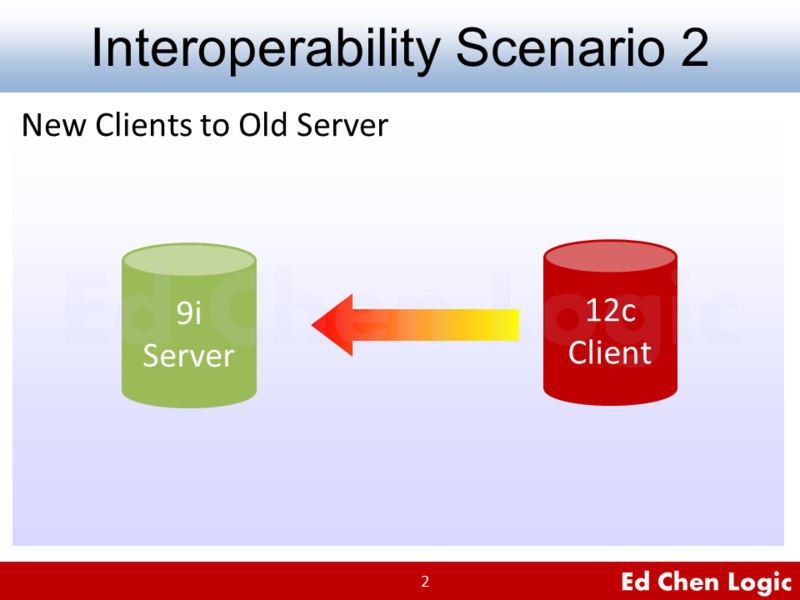 I knew there could be some interoperability problems between versions, especially when the version gap is big like this case, Oracle 9i client connect to 12c database. But I didn’t expect ORA-28040 to show up. Same error may occur while you’re using old Oracle JDBC drivers, say ojdbc14.jar or below, to connect a 12c database. I’ll talk more about Oracle JDBC driver with ORA-28040 later in the post. Let’s see the content of ORA-28040. There was no acceptable authentication protocol for either client or server. The administrator should set the values of the SQLNET.ALLOWED_LOGON_VERSION_SERVER and SQLNET.ALLOWED_LOGON_VERSION_CLIENT parameters, on both the client and on the server, to values that match the minimum version software supported in the system. This error ORA-28040 is also raised when the client is authenticating to a user account which was created without a verifier suitable for the client software version. In this situation, that account’s password must be reset, in order for the required verifier to be generated and allow authentication to proceed successfully. According to the above explanation about ORA-28040, we should provide compatible authentication protocol for either client or server to accept. But now the question is: Should we change server configuration or just upgrade Oracle clients? In fact, it depends on what privileges you have. For database administrators, you can change the server configuration to solve all users’ problems at once. As for developers, fixing or upgrading Oracle clients is the only choice you can do, so as to match authenticated protocol of Oracle 12c databases. For better understanding different applicable situations, I will split the solutions against ORA-28040 into two main parts in this post, the first part is for server side, the other one is for client side. If you have the right to change the network configuration on the server side, then you have chances to solve ORA-28040 for all users in minutes. As a matter of fact, most developers do not have the right, DBA do. When your users refused to upgrade their old clients to connect a higher version of database, say 12c, ORA-28040 would become a frequent and typical error in your daily job. After searching for some other solutions, I found an Oracle documentation about “Parameters for the sqlnet.ora File” is very helpful to explain ORA-28040. In which, it explains in what situation we should use SQLNET.ALLOWED_LOGON_VERSION_SERVER to be compatible with both ends of authentication protocol. To set the minimum authentication protocol allowed when connecting to Oracle Database instances. The term VERSION in the parameter name refers to the version of the authentication protocol, not the Oracle Database release. 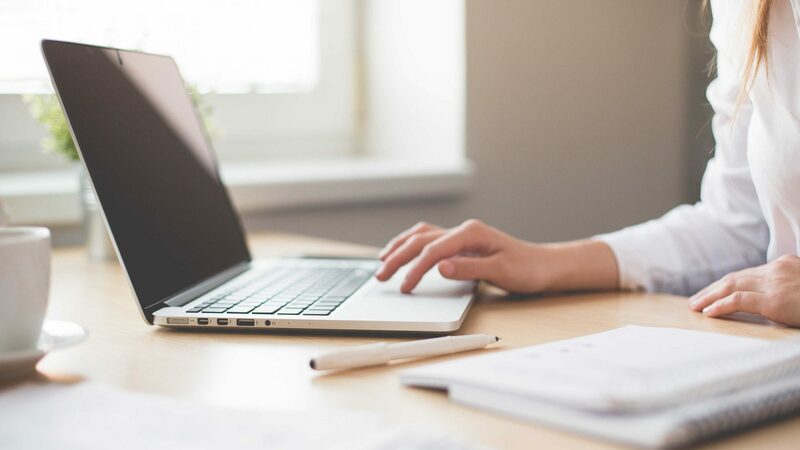 If the client version does not meet or exceed the value defined by this parameter, then authentication fails with an ORA-28040: No matching authentication protocol error or an ORA-03134: Connections to this server version are no longer supported error. Here is my solution to ORA-28040: Adding SQLNET.ALLOWED_LOGON_VERSION_SERVER=8 to sqlnet.ora in 12.1 database server (not the old client). Please note that, you should use sqlnet.ora at database-level, not grid-level if you’re in a RAC environment according to MOS Doc ID 562589.1. And I have confirmed that. As for taking effect, you don’t have to restart listener, the new incoming connections will apply the new values. Just make sure the setting is correct. This time, no ORA-28040 showed up as we expected. in sqlnet.ora to prevent unmatched authenticated protocol error ORA-28040. 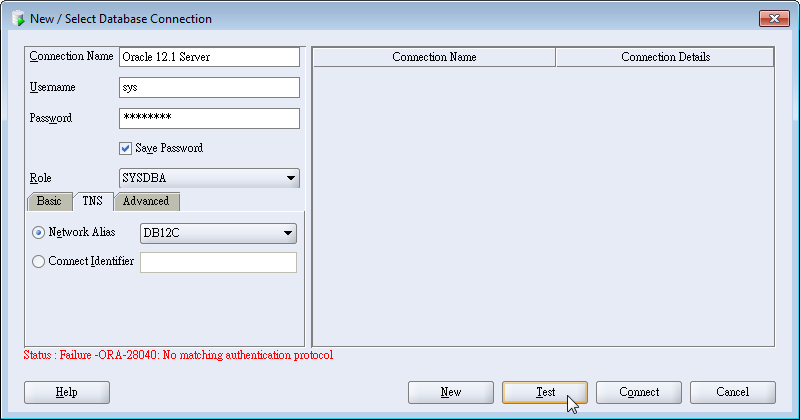 To set the minimum authentication protocol allowed for clients, and when a server is acting as a client, such as connecting over a database link, when connecting to Oracle Database instances. 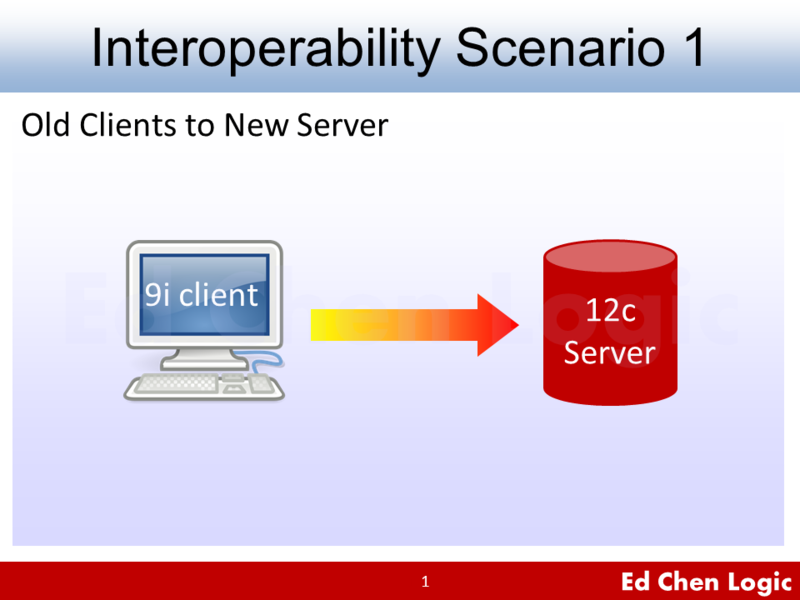 The connections from 9i to 12c can be worked around by the solutions provided in this post. In contrast, 12c to 9i usually fails due to ORA-03134, not ORA-28040. How to Resolve ORA-03134: Connections to this server version are no longer supported. Developers who don’t act as DBA may have no right to change SQLNET.ORA on the server. Therefore, changing or upgrading their own clients is probably the only solution to ORA-28040: No matching authentication protocol. From now on, we begin to focus on clients. Especially for those who are using Oracle JDBC drivers. Since Oracle 12.1 database claims that it is compatible with ojdbc6.jar for JDK 6 or ojdbc7.jar for JDK 7, so ojdbc14.jar for JDK 1.4 or below is no longer matching for clients to connect through the authenticated protocol of a 12.1 database. That’s why you see ORA-28040 in java.sql.SQLException error stack. More information for JDBC developers can be found at Oracle Database JDBC Developer’s Guide: Version Compatibility for Oracle JDBC Drivers. Now, let’s see some client tools that generate ORA-28040 and how we handle it. 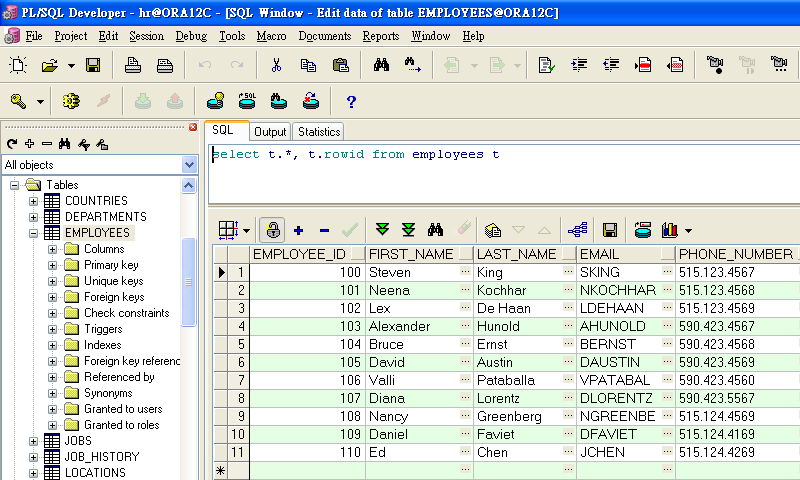 If you were using old SQL developer like this, you will see ORA-28040 whenever you connect to a 12.1 database. Basically, SQL developer is a self-contained software, you can unzip the software and start to use it. That is to say, SQL developer usually uses its own JDK including JDBC driver to run itself. 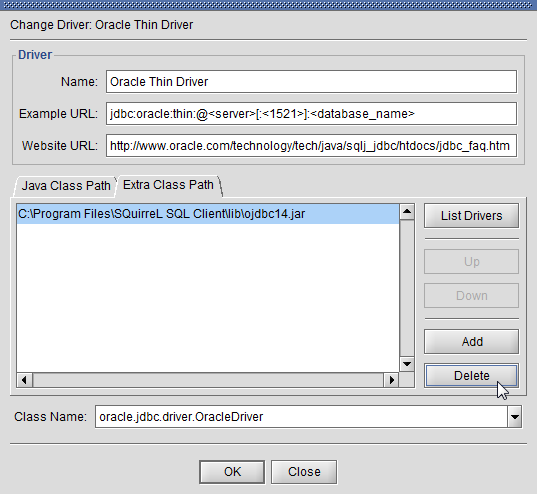 Even though I saw no chance to swap Oracle JDBC driver in the same old SQL developer, you can always download the newest SQL developer with newer Oracle JDBC driver from Oracle website. So as to solve ORA-28040. Don’t worry about the connection settings, the new SQL developer will prompt you the migration option in your first time open. 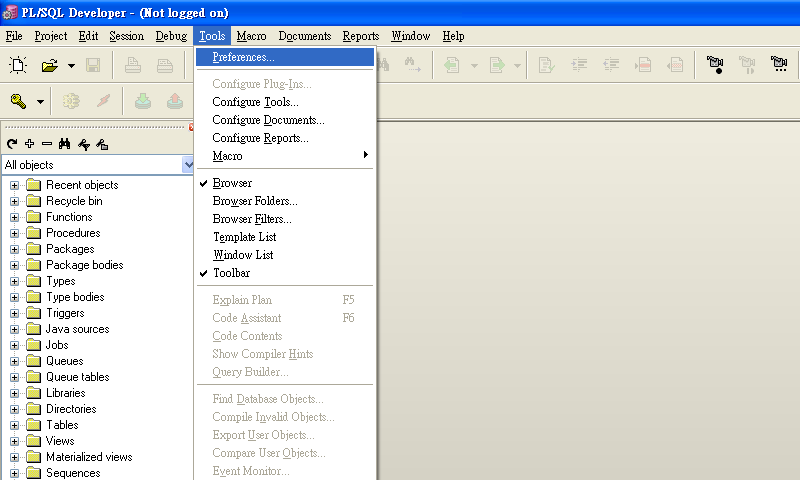 PL/SQL developer is an install-based software. Generally, it leverages your native Oracle client to find necessary configuration file. 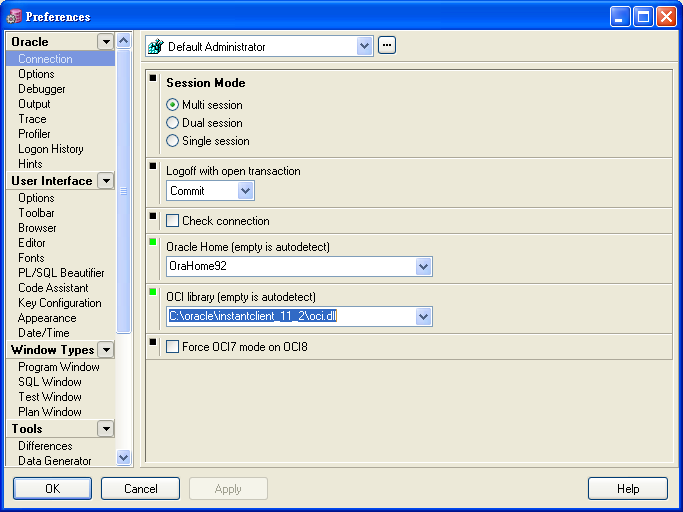 Furthermore, it uses Oracle Call Interface (OCI) of your native Oracle client to connect Oracle databases. 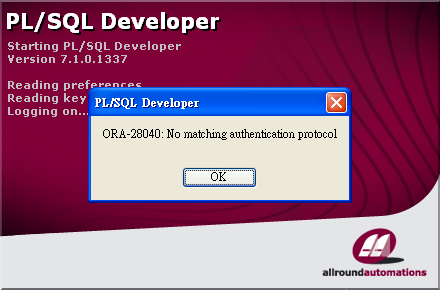 The solution to ORA-28040 in PL/SQL developer is to replace the old OCI with a newer one. First of all, you have to download an Oracle instant client which contains corresponding OCI library. The proper version should be at least 11g. In our case, I downloaded and unzipped a basic package of Oracle instant client for windows 32-bit to C:\oracle, the filename is instantclient-basic-nt-11.2.0.4.0.zip for instance. Please make sure that at least Microsoft Visual Studio 2005 Redistributable has been installed in your machine before using Oracle instant client 11.2. Click on the function menu and search for Tools -> Preferences to open the dialog. 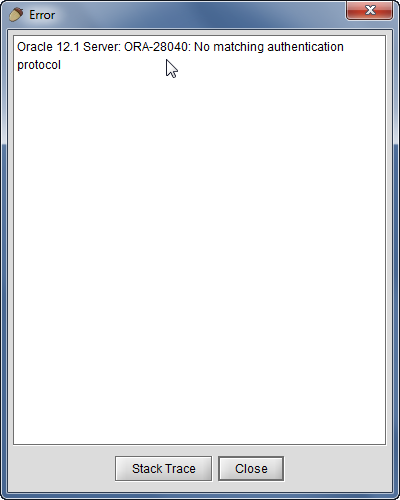 Click on Oracle -> Connection to check current Oracle Home. Point to new unzipped instant client’s OCI. Please note that, you have to provide the whole absolute path including the filename, not just only the directory. 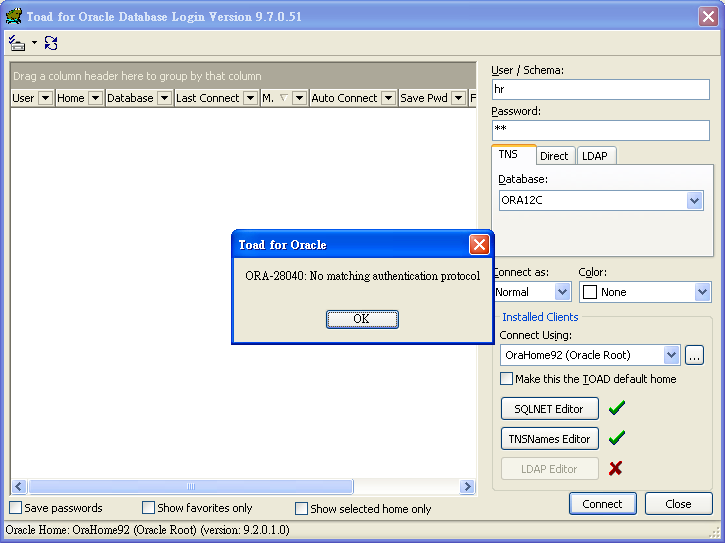 Restart PL/SQL developer and logon an Oracle 12c database. That’s how we fight against ORA-28040 in PL/SQL Developer. 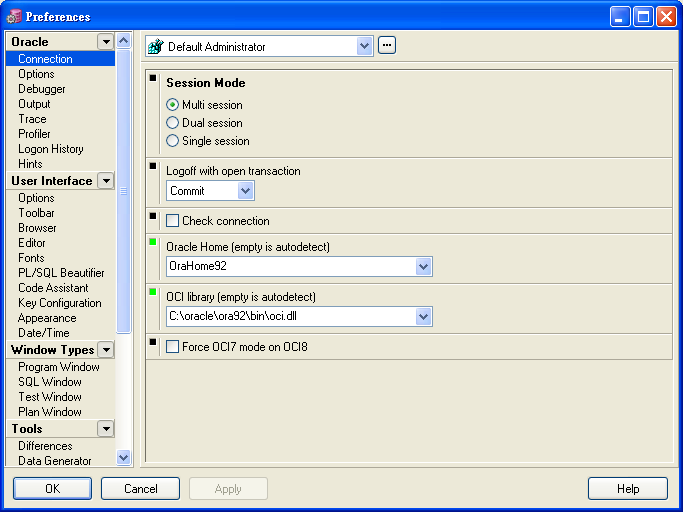 Toad for Oracle is also an installer-based software that is mainly used for database administration and sometimes for development. Same error ORA-28040 may occur in Toad for Oracle, if the underlying network substrate is the same old Oracle 9.2. As we can see, the tool utilized the underlying Oracle client 9.2 to connect a 12c database. That’s why we saw ORA-28040 alert in Toad for Oracle 9.7. The solution to ORA-28040 in Toad for Oracle is pretty straightforward, just install a newer Oracle client, at least 11g for Toad to utilize of. Please note that, Oracle client and Oracle instant client are different, the former is an install-based and full-fledged software, the later is a portable and partial-functioned package. In this case, I downloaded and installed Oracle client 11.2.0.1 for windows 32-bit from Oracle website. Consequently, the newly installed Oracle client creates some registry parameters like ORACLE_HOME and TNS_ADMIN as environment variables for tools like Toad to recognize. So that, the restarted Toad will automatically detect the new Oracle client for us. As we can see, the new Oracle client is found by Toad and ready to be used to match the authentication protocol of an Oracle 12c database. If the new Oracle client is not detected and selected, you should use the drop-down list to choose the right one to use. Nevertheless, if there’s no new Oracle client in the drop-down list, you should check required registry parameters of the new Oracle client, such as ORACLE_HOME and TNS_ADMIN in Windows. 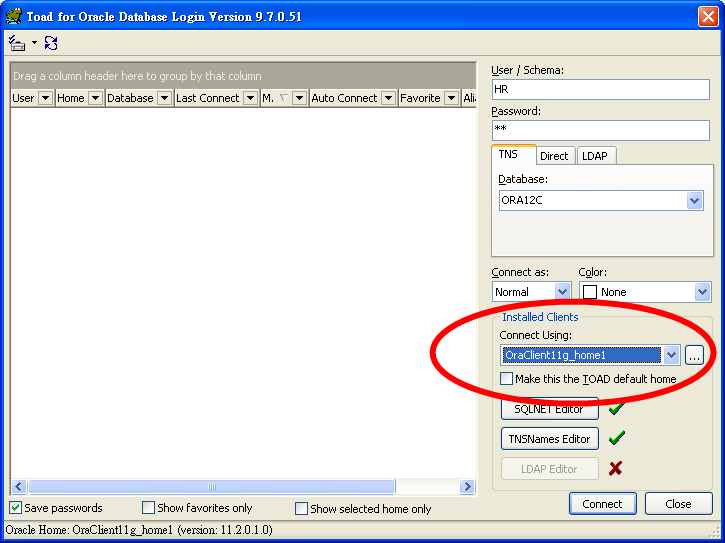 SQuirreL SQL Client is a pure Java-based software that can access databases given proper JDBC drivers. In this tool, I used ojdbc14.jar to connect a 12c database, the error is the same, ORA-28040: No matching authentication protocol. How we handle it? 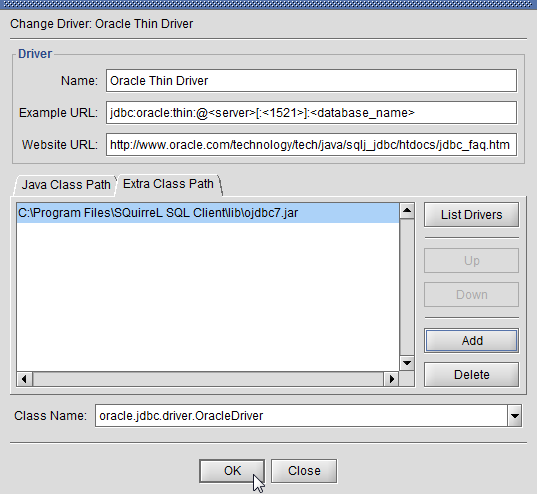 This time, we don’t have to upgrade the software like SQL developer to solve ORA-28040, because this tool allows us to replace Oracle JDBC Driver with a newer version. In this case, we replace the old driver ojdbc14.jar with newer ojdbc7.jar. 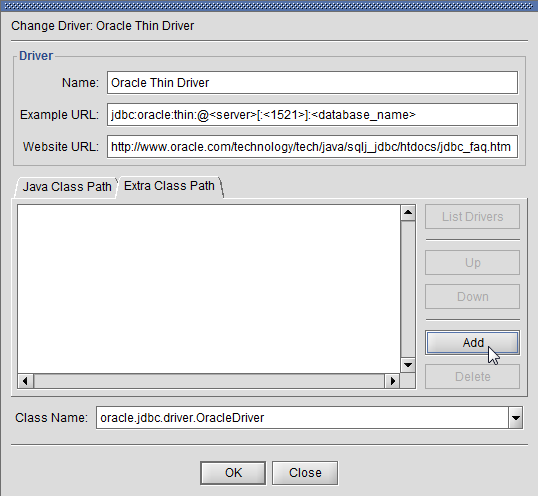 First of all, you have to choose and download a proper JDBC driver that matches the authenticated protocol of 12c database at Oracle JDBC and UCP Downloads page. 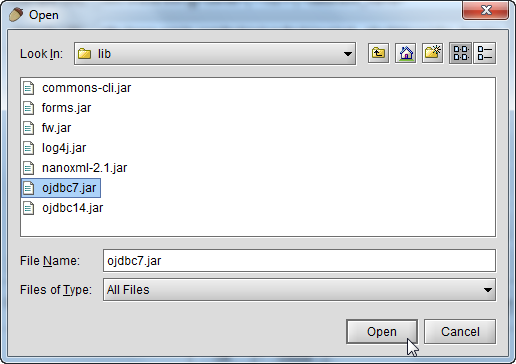 For 12c databases, either ojdbc6.jar or ojdbc7.jar Oracle JDBC driver is proper to solve ORA-28040. Delete the old driver which is ojdbc14.jar. The new driver is selected as shown below. After replacing the old Oracle JDBC driver with a newer one, we can now test the connection again. The connection is successful, no longer ORA-28040. Various kinds of interoperability problems like ORA-28040 may occur during data migrations or database upgrades. To figure out the relationship between versions, we need a more understandable way to guide us. 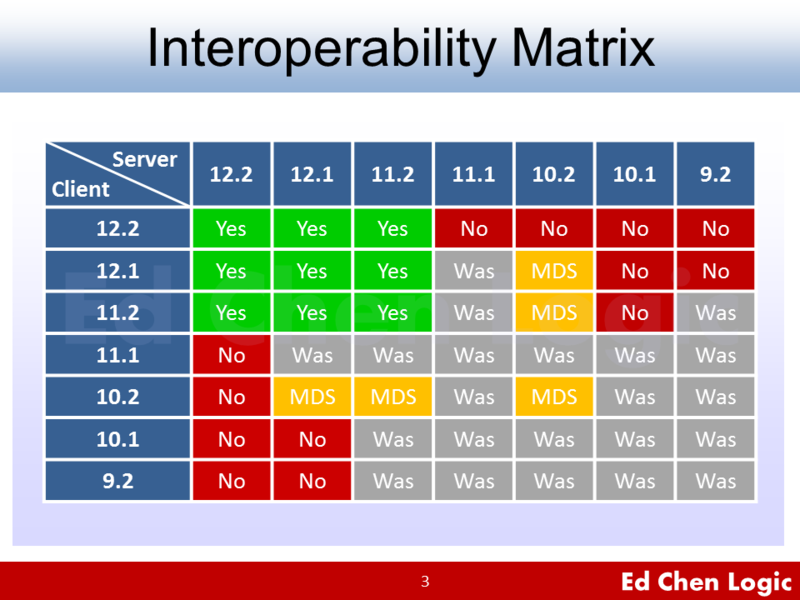 Oracle unofficially releases a matrix that describes certified interoperability among database versions. Here I redraw the matrix so as to get it clearer. In the matrix, interoperabilities like “Was” and “MDS” are partially or conditionally certified between client and server. You should go to the page for more information. Although we can add compatible parameters into SQLNET.ORA to resolve ORA-28040, it is definitely not the only error you may encounter between versions. For example, ORA-03134 is another blocker that you might need to fight against in some cases. Not like ORA-28040, ORA-03134: Connections to this server version are no longer supported is not an authentication protocol problem, it’s a supporting problem between versions. We have to take care of it very seriously.